The game may lag on old devices & devices with 4k screens. Please restart the game if you experience lag over time. This game is one of Lunime’s best games, along with GachaVerse, I love that you have 20 slots to create 20 OC’s! Also the MiniGames are really fun, along with Life Mode! I am mainly on this game for making series’s with my OC’s, but there is something that bothered me. It says under ‘WHATS NEW’ that there has been a World Wide Realise, but my friend is on Apple and she can’t find it in the app store, I thought she was being blind at first but then I checked on my dad’s Apple iPad, and it wasn’t there when I searched it. 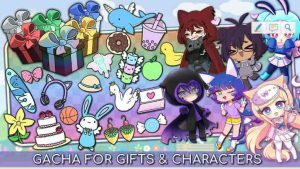 Other than that I really love GachaLife and I can’t wait to see the game improve! This game is really cool! The characters are so cute along with the adorable poses! But on problem I had with this is that I can’t type with I want them to talk. I don’t know if it’s just me but Everytime I go to the chat bubble to type, it won’t show my keyboard that would usually be at the bottom. Could someone help me with this? Other than that this game is awesome! I absolutly love it. Also i have a couple suggestions 1. Have a setting where you can grab a body part and shift and move it. (This one is a lot to ask for and probably very difficult to make it do that.) 2. Have it ask for pictures so you can add your own background instead of editing it I had more but i forgot them lol. I hope you read this and find a way to do at least 2 or make other fixes!! Everything in the game seems fine but sometimes the screen gos smaller on my screen but i think thats because i have new phone! Lol.